Polhøgda was the home of the famous Norwegian polar explorer, scientist, diplomat, humanist and Nobel Peace Prize laureate Fridtjof Nansen (1861–1930), and is located at Lysaker just outside Oslo. 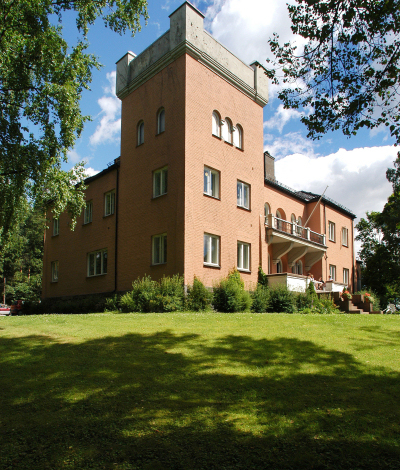 Fridtjof Nansen lived at Polhøgda from its completion in 1901 until his death. His grave is located in the garden in front of the manor. It is our condition that this property shall be maintained as a lasting memorial to Fridtjof Nansen, and that it shall serve as a framework for those of his belongings that have public interest. It is, however, not to be used a museum, but utilized in the best way possible for today, as lodgings or place of work, preferably in connection with interests that are close to Fridtjof Nansen’s life and work. Since 1958, Polhøgda has been home to the independent, non-profit Fridtjof Nansen Institute, which focuses its research on a topic that dominated Nansen's later life: How to solve global and regional problems through international cooperation? The house, being a place of work, is not open to the general public, but the large garden, including the grave of Fridtjof Nansen, is always accessible. «Begrav meg under godbjørka mi» ('Fridtjof Nansen: «Bury me under my favourite birch tree»'). Aftenposten, 26.03.2016. In Norwegian.